Th!nk Promotional Group: Marketing, Branding and Incentives. Some friends have affectionately called this year, “the year of the Yeti”. We know you know what they are. You know your clients know what they are. Well here’s our CUSTOMIZABLE, promotional version: The Himalayan Stainless Steel Tumbler! It includes “ Double Wall Construction For Insulation Of Hot Or Cold Liquids” and it has special spill‐proof technology for those upcoming tailgates, parties, and pool days where you don’t want to make a mess. You might also be outdoors and have your drink for a while ‐ this cup boasts that it can keep cold drinks cold and hot drinks hot for six hours! Cup options: silver, white, black, blue, green, orange, purple or teal. Lid options: clear, blue, charcoal, lime green, or red. This entry was posted in Uncategorized on September 8, 2016 by thinkpg. What do people love to receive more than anything else? Free food. Trust me, I remember college. Even though your clients probably aren’t in college, they’ll appreciate having these little snacks to keep in their purse, office drawer, or car, and when they’re hungry, they’ll grab it and see your company name! 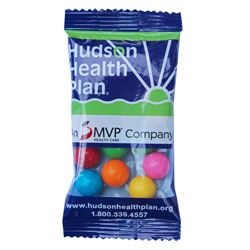 For as low as 85 cents/unit, you can have a custom branded 5” bag filled with treats that will keep your clients satisfied! This entry was posted in Uncategorized on August 20, 2015 by thinkpg. Go on Instagram, and what will you see? People posting pictures of food and drinks. And what would make a better picture than a brightly-colored bottle and straw- with beautiful fruit in it? And oh yeah, that’s your logo on the side, so all the poster’s followers will see your company’s name. So yeah, that coolness we mentioned? Literally- you’ll keep your clients cool and hydrated during these hot summer months; and figuratively, you’ll keep them looking cool on their Insta. 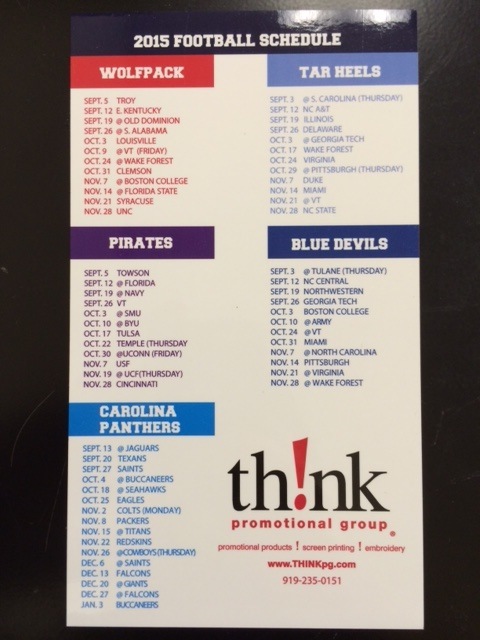 This entry was posted in Promotional Items and tagged corporate merchandise, Drinkware on August 3, 2015 by thinkpg. What better to give your fans (and fans of football) something everyone uses at tailgates already- a koozie! 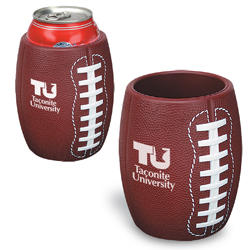 Football koozies are cute, fun, practical, and ring in at $4.25/unit. A mini football stress ball is the perfect thing to squeeze during those nail-biting moments that occur in every good football game. 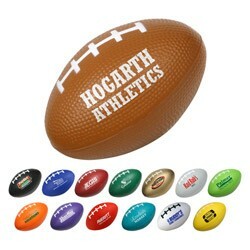 For as low as 87 cents, your company can be that stress relief for any football fan! 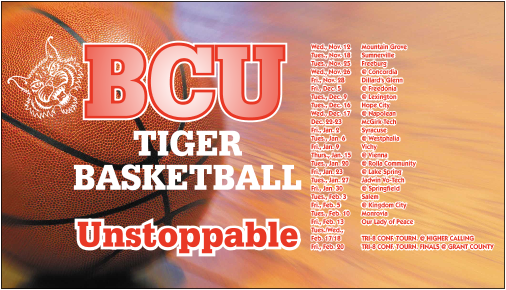 Show your company’s team spirit with a fully-customizable game schedule magnet You can use any team, whether it be pro, college, or high school, and add your company’s logo. Then, every time the recipient of this magnet checks to confirm a date or just passes their refrigerator, they’ll remember who gave this to them! We are doing the same thing we’re advising you to do above! The schedule magnet to the right has the football schedule for the Wolfpack, Tar Heels, Pirates, Blue Devils, and the Carolina Panthers! We’re giving these away to anyone who requests them, so let us know if you want one! This entry was posted in Uncategorized on July 20, 2015 by thinkpg. Perfect for runners, beach-goers, golf-players, and anyone who either wants to or has to spend time outdoors- the “Keep it Cool” towel will soak up sweat as well as refresh you with it’s “Keep It Cool” technology! 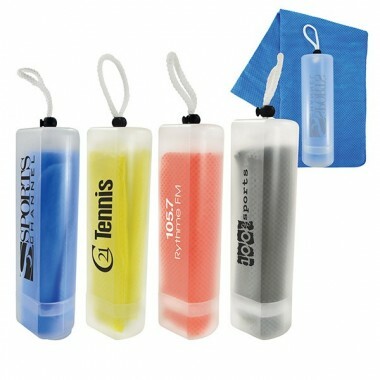 This promotional product rings in at just $6.59 and will have your logo on the carrier and comes in a variety of colors. 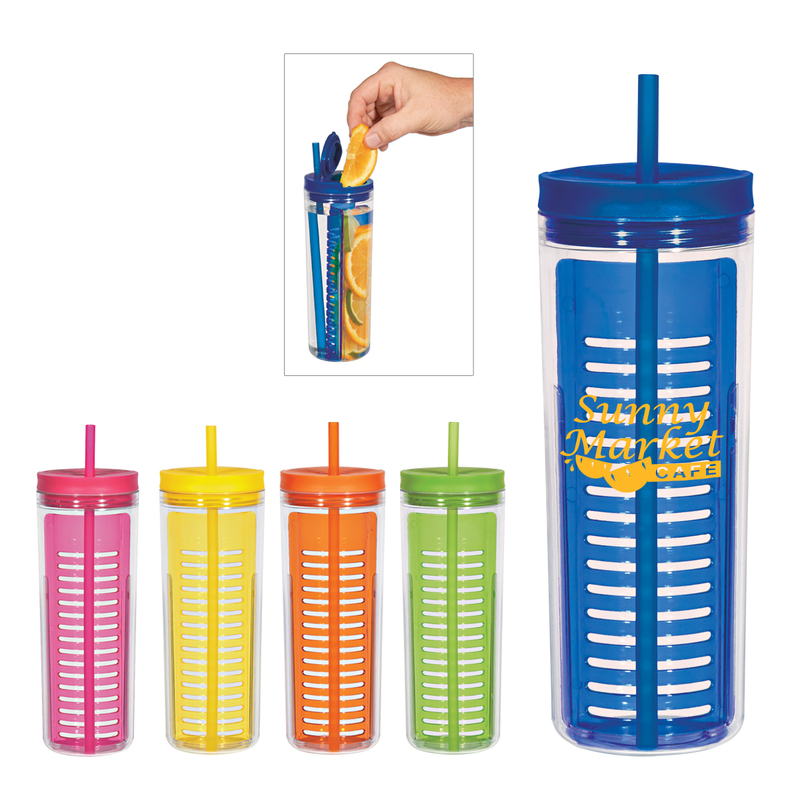 This is a great promotional product, and perfect for summer! This entry was posted in Uncategorized on July 13, 2015 by thinkpg. Please the Crowds this Summer- for as low as $1.99! Everyone loves going to the beach. But what’s the worst part about the beach? SAND. Wouldn’t you like to provide your customers with the ability to keep their refreshing drinks sand-free? And get your company’s name out there at the same time? If so, the Beach Nik is the promotional product for you! The Beach Nik is a cup with a cone that canned or bottled drinks can be placed in, and then the cone is pushed into the sand. You can also keep your phone, sunglasses, or anything one might need at the beach in it! This is not a product that will get thrown out; this is a product that will get packed in a beach bag and used over and over. And when your customer or potential customer is soaking up the sun, enjoying the beach and their sand-free drink or phone, they’ll think of you warmly. This entry was posted in Corporate Merchandise, Outdoor Events and tagged #beachnik, #summer, Drinkware on July 2, 2015 by thinkpg. For as low as $6.75, you can share the leather love with your clients and potential clients! 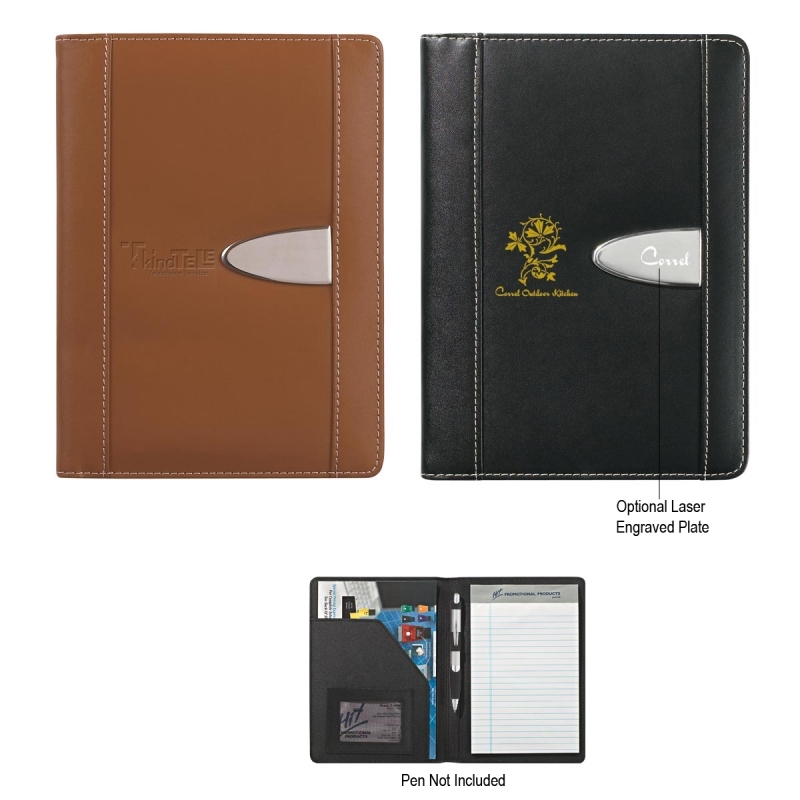 In black or brown, these professional portfolios can be customized with your company logo printed or embossed on the cover. So, wherever a recipient uses this, others will see your company name! And, since it’s such a nice gift, they’ll think even more highly of you. Pockets, pen-holder, and notepad inside. Let us know if you’d like to order! This entry was posted in Corporate Merchandise, Gifts, Marketing Department, Promotional Items, Uncategorized and tagged corporate merchandise, Educational, Leather Portfolios, swag on June 29, 2015 by thinkpg.